It’s been a long winter here at the end of the road. We had a lot of snow and cold temperatures that tested the metal of the habitants who chose to winter here in Ely. We had some warmer weather in mid March, but then Old Man Winter decided he wasn’t done yet. March ended on a cold note, and April’s first week was much more winter than spring. I enjoy cross country skiing, but things got icy out on the trails, and so the last few weeks getting out have been limited to walking around town. I took my bike out for the first ride of the last week when the temperature broke forty. It wasn’t a long ride, but it felt good to ride again. Today the weather forecast predicted highs in the low to mid fifties, and when I looked at the sunshine and blue skies, I decided that today was the day to get out on the open road. Walt Whitman wrote that all great and heroic thoughts came to him when he was out traveling the open road. I feel the same way, when I ride my hybrid bike around Ely. Most people don’t think about bicycles when the come north to visit us at the end of the road, but Ely is a great place to ride bike. One of the best things about living in Ely is that it really is a very small place. We are listed at 3,460 people for the last census Ely is less than ¾ mile wide, by a mile and a half long. I haven’t owned an automobile for ten years now, and I get along fine without one. My days of ramming my fat tired bike along rock strewn trails are behind me. I will leave that kind of cycling to younger riders. I ride a comfortable hybrid bike that’s made to ride easy on either asphalt or gravel. I call it my comfort bike. It is a Haro Heartland and from the first time I sat on it, I knew it was the bike for me. Today was my first real ride of the season. I have loved riding bicycles since I was a boy. I didn’t ride during my prime years, but when my back started giving me problems, I found riding bike to be something that I enjoyed doing. It was easy on my body, and cycling enabled me to cover a lot more ground then I can by walking. It is also lots more fun. I love riding bike. I decided ten miles was about as far as I wanted to go, so I decided that a cycle out to Winton and then back home on the old road would be a great start to the season. Winton is four miles from my home on Harvey Street, and the old road between Ely and Winton is a nice way to come back home, because the hills aren’t so steep. Riding to Winton is easy, because it’s mostly down hill. If you’re looking to build your endurance riding the main highway back to Ely is almost a three mile ride; and it is all up hill. Riding the old road home is lots easier and way more fun. Generally speaking I prefer riding what I call; The Paths of Least Resistance. If there is an easy way to take a ride, then usually that’s the way I want to go. I spotted a single robin in a neighbor’s yard yesterday hunting earth worms in the warm sunshine. She was the first robin of the year. I hope I never get past the excitement and wonder of seeing the first robin of spring. The starlings and crow scouts have been around for weeks now, but there is something about seeing that first robin of spring that stirs something deep inside me. Today, as if to reinforce the changing of seasons, I spotted a pair of robins gathering up bits and pieces as they start to build a new nest where they will raise one or two batches of a new generation. Many people who walk or ride bike have music piped into their heads, but I prefer to listen to the natural sounds as I ride along. 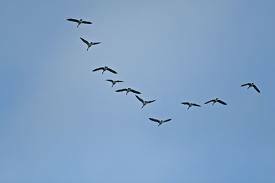 Today I was rewarded by hearing the wonderful music of geese making their way north for another summer. Ely isn’t a big place for geese. We have a few small local flocks, but most of the geese will move on to places more suited to their needs. What they needed this morning was open water where they could rest in safety. They found what they needed on the Shagawa River. When I got close to the river I could see and hear that the river was full of Canada Geese and Golden Eye Ducks. The thing that makes Golden Eyes special is they are the only duck that winters over in places like Ely. All they need is a little open water, so they gather around rapids that never freeze. They are also the only duck that can swallow underwater. I took out my binoculars and had a good lock at the wonder of an unfolding spring. I closed my eyes as another flock of twenty honkers, who were riding an easy blowing south wind decided to join their cousins on the Shagawa River. The sound of honking geese entered into my soul. They were so close overhead that I could hear the whooshing sound of their powerful wings, and hear the flock of twenty three as they splashed down in the river. I started counting geese and I stopped when the count reached a hundred and fifty birds. Then I continued on my way, peddling away to the joyful sound of spring geese happily honking away; enjoying the open water. This time of year people start watching the ice trying to gage how long it will take before we see open water. Each year hundreds of people send in their guesses as to when the ice will leave Shagawa Lake. The last time I saw Shagawa Lake was a few weeks back when I was on a pair of skis, and judging by what I saw when I looked out from the south shore of the lake, was that if I wanted to, I could still be skiing on Shagawa Lake. It will be a few more weeks I think before we will see open water on Shagawa Lake, so there is still time to get your guess into the Ely Echo. I was about to put my binoculars away when I noticed a bird high up in the sky, and when I focused in on the bird, I could see it was a Bald Eagle heading north looking for its patch of open water and maybe a dinner of fish after a long day of travel. A week ago spring seemed a long way off, but after seeing Canada Geese swimming on open water, and robins singing in the morning, spring doesn’t seem so far off today.